I remember the first time years ago when I first heard of "beer can chicken." I thought...what the heck is that? But, I like beer, so I gave it a try. This is now one of my favorite ways to BBQ / grill chicken. It's easy to do and the end product is as good as it gets. It is always moist, delicious and perfectly cooked. Simply put, you shove a half empty can of beer up the rear side of the chicken and then prop it on the grill using indirect heat. I always apply some good rub to the outside of the bird before placing it on the grill. After an hour and a half you end up with golden, moist chicken like the picture above. Below are some additional pictures to look at, but PLEASE view the short video below. Here are a few pointers and then I encourage you to watch the video. 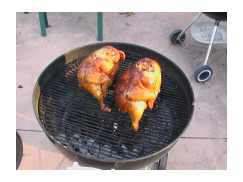 Don't forget to sign up for The BBQ Gazette E-zine for more BBQ and grilling tips. Use Beer You Like to Drink: Duh. Why would you use beer you don't like? Someone has to drink the half you pour out! 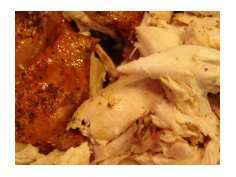 Use the Indirect Heating Method: This circulates the heat up and around the chicken as opposed to directly under the meat. Use a Weber Grill: If you have a choice, use a Weber. 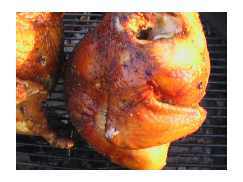 Gas works "ok" but the best beer can chickens I have done are on Weber grills. Use Hickory Chips: Using an indirect method these chips add GREAT flavor. Don't Add Sauce and spices to the Beer: As cool as it sounds, sauces and spices do not steam into the meat. Trust me, I've tried it both ways. It's a waste. 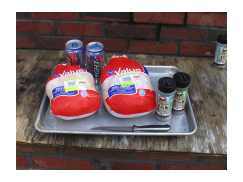 Buy a Set of Silicon Gloves: Taking the chicken off the grill can be a hot proposition, especially pulling the cans out. Silicon gloves will protect you. 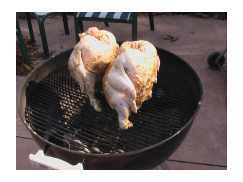 Check Out Accessories for Beer Can Chicken: There are accessories that eliminate the balancing act on the beer cans. Definitely a good investment. Click Here to view the beer can chicken utensil. Click Here to see the grilling gloves.